Utilises nylon eye mesh with 70% better visibility in anti squash shape. 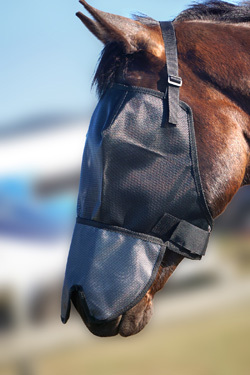 Clever nose flap design that tapers around the nostril, your horse will love that he can breathe. Also comes with combo rug connectors to attach to our Combo range. For full head protection on its own or as an easy off hood at night that teams with our Combo. 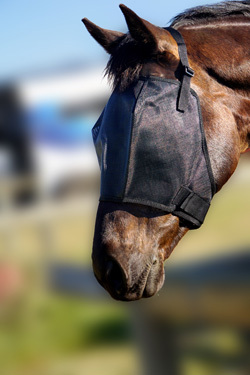 This Wild Horse Australia product utilises Insect Shield® Patented technology process to tightly bond Permethrin to the fabric. These products help to provide optimum protection all year round, from Permethrin sensitive, disease carrying insects. They are approved by the EPA & the World Health Organisation to last through 25 detergent washes or six months full time weathering. 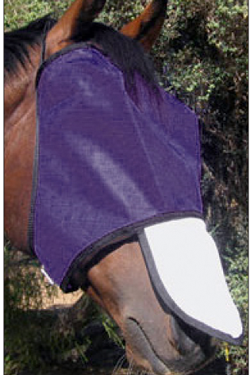 The protection is odourless so it will not affect your horses sensitive sense of smell. 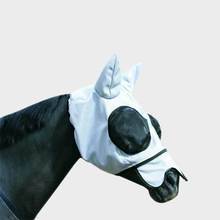 It is Insect protection that remains in your Fly Mask, not on your horse. Insects can bite through around or under standard fabrics. This product offers long term Insect Protection.